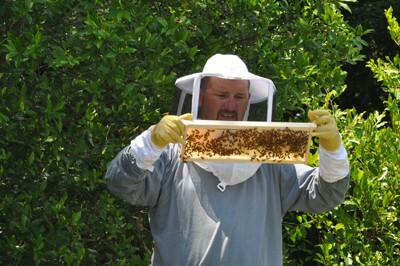 The sweet taste of honey will soon be filling our honey pot, so living with bees works for us. Hubby spent the morning checking on the hives and after a rocky start, that included losing about 1/3 of our hive, things are looking great. 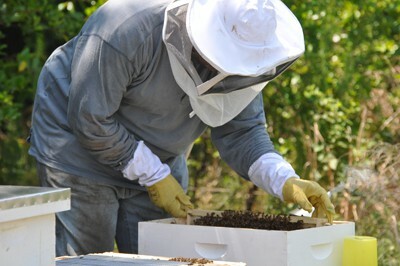 Our hives are improving and look very promising for a fall harvest. The blackberry blossoms have all but died but the corn is tasselling and there is an abundance of sunflowers that are providing nectar. They finally started to pull comb in the upper hives, hubby saw the queens and they were laying eggs and looking healthier. As with everything else on the farm bee raising comes with a learning curve as well. Libby our lab has learned to stay at least 20 feet away from the hive and I have learned that the bees will seek water where ever they find it…even if it means in a water collection bucket I have under the downspout, beside the door. Honey is very expensive, so I have not experimented with some of the honey recipes I have saved but I am looking forward to having an abundance of it so I can put it to the test this winter. I do use honey in my tea and coffee every day and Craig loves my Honey Wheat bread, but there are so many uses for it I just can’t wait to get started. Even the beeswax candles are calling my name! The day hubby brought a piece of honey comb to the house for me to taste was like heaven on the farm and made me longing for more…so honey please bring me more honey and I really don’t mind living with bees! 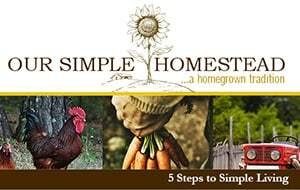 My husband and I are going to take a beekeeping class this fall and hope to start a hive in the spring. I will keep a watch on your blog to learn more! Thanks for sharing! Lisa…I have to admit I don’t do too much with the hives but stand back and take pictures but Craig is loving it. That day he brought a piece of comb up to the house with honey dripping down his arm you couldn’t wipe the smile from his face. I am really looking forward to the blackberry honey we will get next spring when the blackberry are in bloom like crazy around here. I will keep you all updated!